Headlies: The Rock Denies Partnership With The American Sugar Council - WrestleCrap - The Very Worst of Pro Wrestling! 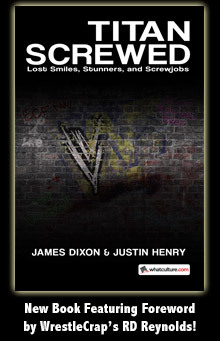 Houston, Texas – After another heated battle of words with his Royal Rumble opponent CM Punk, The Rock has come under fire for repeatedly referring to his opponents as sugary foods. Known for his quick wit and colorful commentary, the People’s Champion, as he is known, raised many eyebrows following his naming of CM Punk as the Carvel ice cream treat “Cookie Puss”. Reports of The Rock moving to Hershey, Pennsylvania have yet to be confirmed. 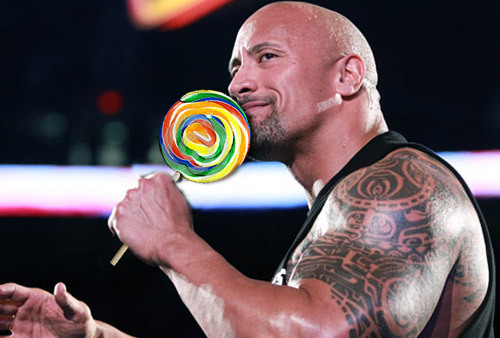 11 Responses to "Headlies: The Rock Denies Partnership With The American Sugar Council"
Rock really looks like he’s going to enjoy that lolly. Hey! What are you implying, R.D?! I can totally see this being a real story. The audience seems to like Rock’s schtick, but personally I think the whole sugar nickname/goofy joke stuff should be scaled back by The Dwayne. I definately smell what your cookin” JM! Great humor. More please?! Glad you enjoyed it! I’ll have some more soon. Can’t hog all the fun from fellow Headlies writers Michael and Travie.